YC8SCO/P is not available to search. OC-209 : Miangas Island (Outer Island 20 - 22 Feb 2014). 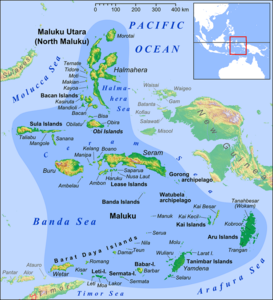 OC-210 : Marore/Ariage/Maru Island (Outer Island - 27 Feb - 03 March 2014). 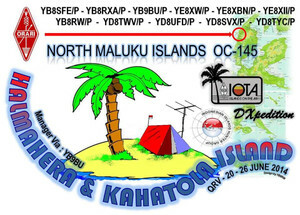 Prepare to Kahatola Island, QRV on 24/06/14 - 27/06/14 de YB8RW/P with team. 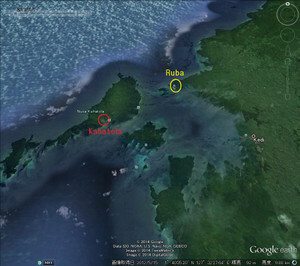 【追々々記】Kahatola Island, OC-145 < 1 mil from our position halmahera island (ruba-ruba basecamp) team will be going to Kahatola Island tomorrow and QRV on till 26 june 14. 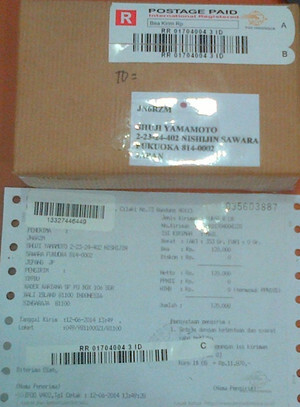 Shuji Yamamoto Does OM Kadek go with this IOTA pedition? 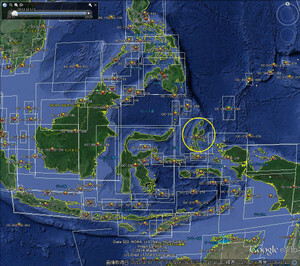 Adhi YB3MM now is in Kupang, Timor Is OC-148. 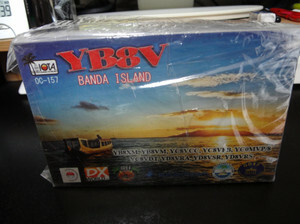 He will try to QRV from home station of YC9MKF as YB3MM/9. 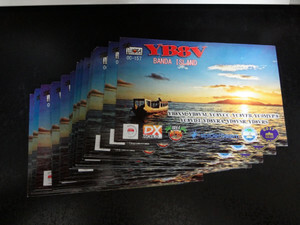 OC-157 YB8V QSL cards for donors "SOON"
I was sent all of the cards YB8V in your requested by registered mail,pse wait,thank's. 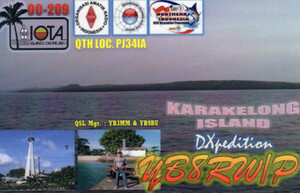 I have been informed by Kadek YB9BU himself that his health condition now OK, and he is able to do QSL ing fully now. As requested by him, I have stopped the request of YB9BU QSLing using my Paypal address. 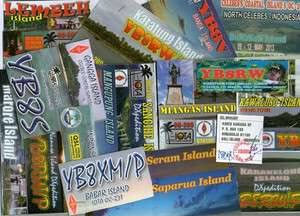 From now on, please QSL direct to YB9BU postal address with SAE + IRC. No green stamp please. Very sorry for this unconvenience. I,m very sorry very long time cannot send some e-mails for many IOTA friends worldwide,because big problem for my health and also trouble with my e-mail address. 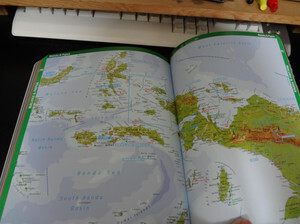 Yes,now I,m getting better and ready to replying some cards for many islands dx-pedition. About YB8V and others,start from tomorrow will be sending in to your address,please wait. 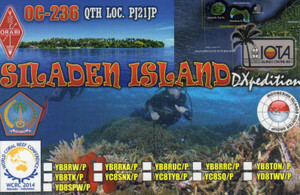 Until now,I,m still Qsl Mgr for Udin,YB8RW ex YC8RSW and his island DX-pedition,thank's. 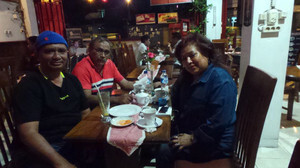 I thank you very much to Adhi,because he help me when I was in the hospital. 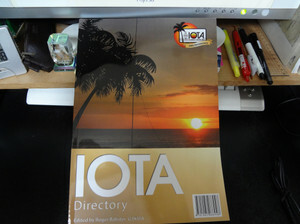 Now I,m OK for my Qsl work,and please help me to relay my message to IOTA friends,thanks. The IOTA DINNER at the annual Visalia Int'l DX Convention is the longest continual running IOTA DINNER at any Convention. We would love to have as many IOTA Chasers & IOTA Expeditioners as possible join us to celebrate this 20th ANNUAL IOTA DINNER in Visalia on Friday Night, April 17, 2015. If you are an IOTA Expeditioner and would like to be considered by the Committee to be a Program Presenter, please check the box on the form and provide just basic information. 20th ANNUAL IOTA DINNER Program in Visalia details will follow later and be posted on the official Convention website in the 'Friday Dinners' section, with a URL for online sign-up to register for the IOTA DINNER(which separate from the main Convention Registration), along with a PayPal option. Ray, Will & myself hope to see you at the 20th ANNUAL IOTA DINNER !!! AS-194P JA6 SENKAKU ISLANDS - sovereignty disputed between Japan and China. In the absence of agreement by the two parties no credit will be given for an operation unless evidence is produced to IOTA Management in advance that specific authorisation has been granted by the goverment with de facto control for the mounting of such an operation. 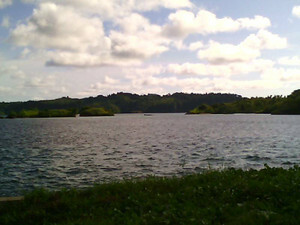 Copies of the special licence and permission to operate from the islands are required. An operation using a standard personal licence will not be accepted unless specifically sanctioned by the goverment with de facto control for use on the Senkaku Islands. 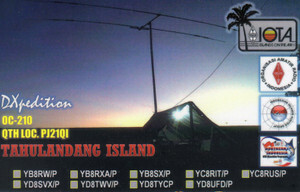 Thanks Budi YF1AR for FB operations and Bob N2OO for Qsl management. 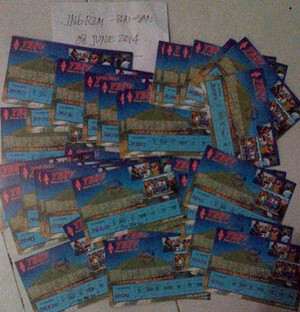 QRZ? OC-075 YC5NM Bintan Island Mar 1994? 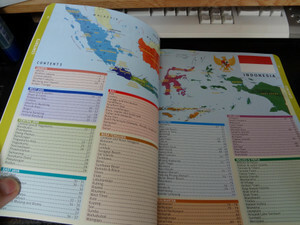 Thanks for the new Indonesian islands list. 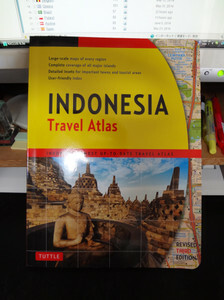 I found a QSO in my log with YC5NM from OC-075 Bintan Island in march 1994 and I have seen this call in your database. 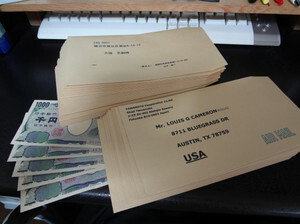 I never got his QSL. Have any info about that? 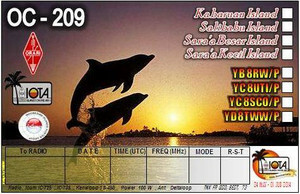 YC8UJW/P, YC8UKJ/P, YD8SVX/P, YD8TWE/P, YD8TWV/P, YD8UCJ/P, YD8UFD/P, data uploaded to clublog. 2. 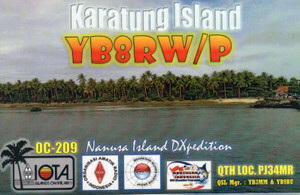 OC-209 Karatung Island (13 – 14 Feb), YB8RW/P, data uploaded to clublog. 3. 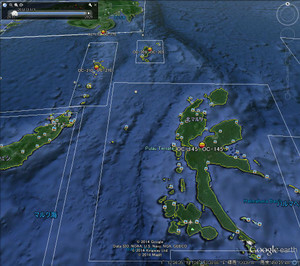 OC-209 Marampit Island (14 – 17 Feb), YB8RW/P, data uploaded to clublog. 4. 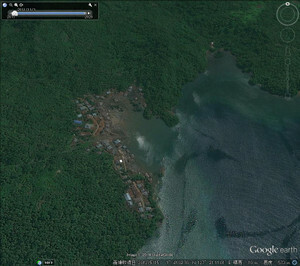 OC-209 Mangupung Island (17 – 19 Feb), YB8RW/,P data uploaded to clublog. 5. 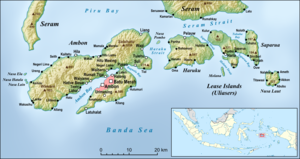 OC-209 Miangas Island (20 – 22 Feb), YB8RW/P, data uploaded to clublog. 6. 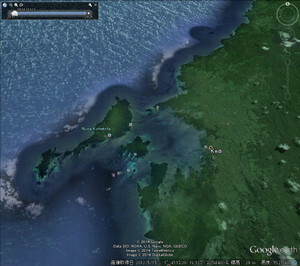 OC-210 Kawaluso Island (23 – 24 Feb), YB8RW/P, data uploaded to clublog. 7. 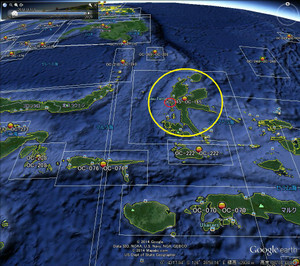 OC-210 Sangihe Island (24 – 26 Feb), YB8RW/P, data uploaded to clublog. 8. 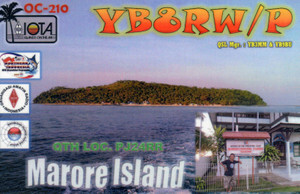 OC-210 Marore Island (27 Feb – 3 Mar), YB8RW/P, data uploaded to clublog. 9. 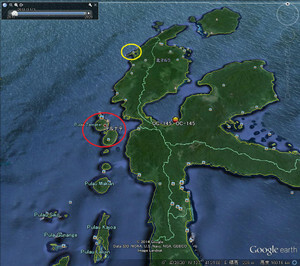 OC-209 Karakelong Island (5 – 7 Mar), YB8RW/P, data uploaded to clublog. 13. 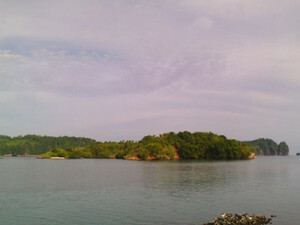 OC-236 Siladen Island (14 – 18 May), YB8RW/P, YB8SNX/P data uploaded to clublog, but still waiting from operators. 14. 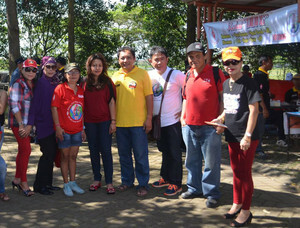 OC-209 Kabaruang Island, Salibabu Island, Saraa Besar Island and Saraa Kecil Island (24-31 May) YB8RW/P etc still waiting log from operators. Han/DS2GOO and members of Korea Contest Club are politely ask fellow DXer/Contester's demand for IOTA references in Rep of Korea. Anyone may vote and choose multiple IOTA references possible in this survey. Expiration of this survey is end of June. After the survey, we will not only provide an official result to DX communities but refer to it for our next IOTA activities also. We hope many votes from the world and want to know actual demand for HL IOTA groups. 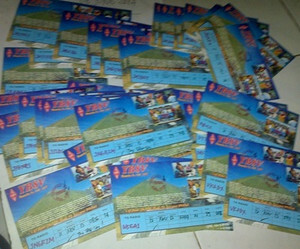 Please see on my Facebook Album for QSL cards.